It’s a celebration of baseball and music, of food and friends, of good times and sunshine in Phoenix. It’s the first-ever Innings Music Festival, scheduled for March 23-25 at Tempe Beach Park in Tempe, AZ. Held on the last weekend of spring training baseball here in the Phoenix, AZ Valley, the Innings Festival is jammed with some of the coolest rock ‘n roll bands, alt-country acts and much more. The music lineup is diverse, from the desert rock of Queens of the Stone Age to the lilting synth-pop of Sylvan Esso and the throwback Valley vibes of the Gin Blossoms. The festival’s three stages will feature great sets from more than 35 artists.This amazing 3-day event is the perfect weekend entertainment destination for fans of Cactus League Spring Training baseball here in the Valley. The overall lineup looks incredible – headliners for the three days include Chris Stapleton, Queens of the Stone Age, and The Avett Brothers. Other well-known music acts appearing at Innings Festival are Counting Crows, The Decemberists, Gin Blossoms, Young The Giant, The Head and the Heart and more. The promoters feel that that the combination of music and baseball is a natural for the warm spring days in the Valley, especially with thousands of visitors here to watch spring training games. Bringing together music fans with baseball fans on a weekend of music is a no-brainer. But there’s a lot more than music happening that weekend. There will be fun baseball activities like batting cages, speed pitching, and appearances by top MLB baseball players. Plus, a huge food court will be on premises, featuring celebrity chef demonstrations, led by the Valley’s own Sanctuary chef, Beau MacMillan. He will curate the food at the festival and will lead food demos that highlight different baseball stars and musicians. With more than 20 food tents at the festival, as well as beer, water, and other refreshments, there will surely be enough for everyone! Click over to Innings Festival Tickets page to buy your tickets. The Coronado Neighborhood Association welcomes you to the “Coronado Historically Modern Tour.” Once again, we will gather at Coronado Park to enjoy food, music, a lively street fair and homes open to tour. The Coronado Neighborhood Association welcomes you to the 2018 Coronado Home Tour. Once again, we will gather at Coronado Park and enjoy food surrounded by music, a lively street fair and historically modern homes open to tour. Visit historical homes in Revival, Norman and Bungalow styles in the Coronado Historic District near downtown Phoenix in this tour’s 31st year. A street fair featuring local vendors, food trucks, bicycles and classic cars is part of the celebration. The District PHX Street Fair and entertainment stage at Coronado Park are FREE for all to enjoy! This year’s tour will highlight both homes with a preserved history and ones that are fully renovated. Coronado is home to many types of architecture including Craftsman and and California Bungalows, Spanish and Pueblo Revival, Tudor style homes and Early / Transitional Ranch style homes, among others. VEHICLE PARKING: Coronado is a residential neighborhood, so you may park in front of any home throughout the area and walk to Coronado Park (two blocks north of McDowell Rd. between 12th and 13th Streets). Please be courteous of residents and do not block driveways. BIKE PARKING: We encourage you to ride your bike to the event. There will be several bike racks available at Coronado Park and one in front of each location on the tour so you can lock your bike up. Please make sure to pick up your bike by 4pm. Details: 10 a.m.-4 p.m. Sunday, Feb. 25. Coronado Park, 1717 N. 12th St., Phoenix. $15 online until Feb. 24, $20 day of; free for children under 18. thecoronadoneighborhood.com. Pick up your wrist band (your pass to the homes on tour) and Tour Guide at the ticket booth in Coronado Park. A Neighborhood That’s a True Community. Willo Historic Neighborhood, one of Downtown Phoenix’s first historic suburbs, will host its home tour and street fair on Sunday, Feb. 11, 2018. The tour invites visitors to explore a variety of architectural home styles, including Tudor, Spanish Revival, Bungalow and Ranch, constructed from the 1920’s through the 1940’s. The history and charm of downtown Phoenix’s historical neighborhoods will be on display at the 30th Anniversary Willo Historic Home Tour & Street Fair. Sponsored by The District PHX, from 10 a.m. to 4 p.m. February 11 in the historic Willo Historic Neighborhood, attendees can view 13 historic residences and a fire station museum, and the street fair features a classic car show, beer/wine garden, live music, food trucks and more than 80 vendors. Advanced tickets are $18 and can be purchased at WilloPhx.com or on-site the day of the event. Visitors to the Willo Historic District will experience a variety of architectural styles including Bungalow, Tudor Revival, Greek Revival, American Colonial Revival, Spanish Colonial Revival, Pueblo Revival and Ranches. The Willo neighborhood is located between Seventh and First Avenues, north of McDowell and south of Thomas. Once considered the suburbs of Phoenix, Willo is comprised of 22 subdivisions developed by various entrepreneurs from the early 1900s through the 1940s. The District PHX is the main event sponsor and helps foster the collaboration between neighbors and investors to restore, improve and revitalize the charm of Phoenix neighborhoods. The organization works with homeowners who need or want to sell their home quickly, regardless of the reason. At the same time, The District PHX helps neighbors protect their most important asset, their home, by revitalizing or rebuilding the property completely in harmony with the existing neighborhood. TICKETS: $18 in advance at WilloPhx.com and $20 at the event. Admission to the Street Fair is free. For tickets, as well as more information on the event and the Willo Historic District, visit www.willophx.com. For more formation on The DistrictPHX, visit www.thedistrictphx.com. The tour will take you through neighborhoods built in the late 19th century to the 1930s, from McDowell to Van Buren, and Central to 7th Avenue. This tour will explore the history of the featured homes as well as the turn of the century architecture, including bungalows, Neoclassical, Tudor, Period Revival and Southwest Vernacular homes. 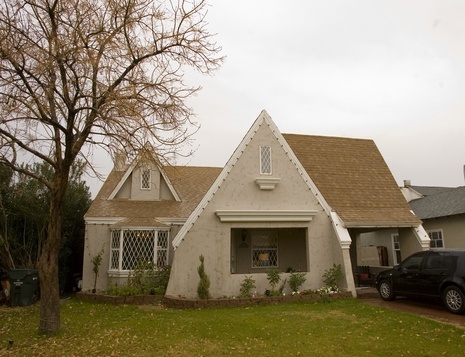 The Roosevelt Neighborhood was the first neighborhood in Phoenix to receive historic designation, one of 35 historic neighborhoods in Phoenix. It is considered the city’s first suburb, and was the home to several prominent early Phoenicians. Learn about the residents, the historic architecture, and so much more as you walk down the 100-year old streets alongside towering, century-old palm trees and explore the rich history of Phoenix. 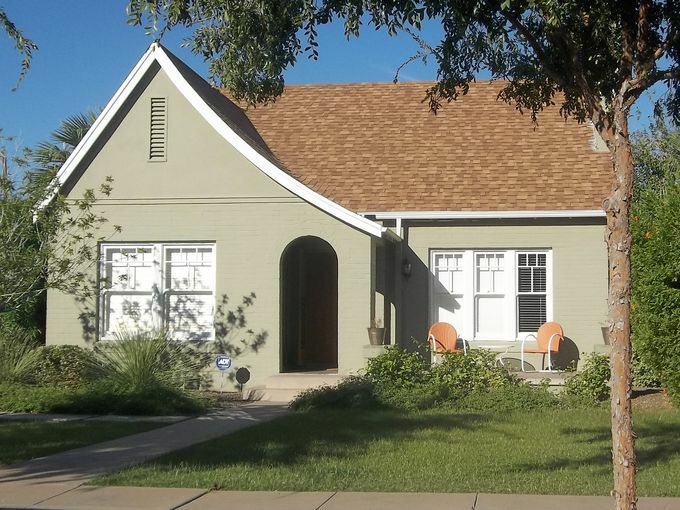 The Roosevelt Action Association holds this informative historic home tour every year to promote the understanding of Phoenix’s past, and to foster neighborhood pride. There will also be food trucks and a craft fair, making this a perfect family event. The self-guided tour tickets are $13 through Nov. 18 and $16 day of event. Guests can buy tickets to tour guided by “hip historian” Marshall Shore for $22 through Nov. 18 and $25 day of event. When: Sunday, November 19, 10 a.m. to 3 p.m.
Where: Between McDowell and Van Buren, from 7th to Central Avenues. The Historic Roosevelt Neighborhood is a modern name for a series of historic neighborhoods that grew North of the city between 1893 and 1930 and it spans from McDowell to Van Buren and from Central Ave to 7th Avenue. Every year, The Roosevelt Action Association hosts a family friendly and informative historical home tour where you can explore turn-of-the-century architecture (Bungalows, Neoclassical, Tudor, Period Revival and Southwest Vernacular Homes). Visit historical homes in Revival, Norman and bungalow styles in the Coronado Historic District near downtown Phoenix in this tour’s 30th year along with Encanto-Palmcroft, Cave Creek and more. Need a little inspiration to get your home and yard in shape? Home and garden tours are a great way to get home-improvement ideas while discovering new parts of the Valley. Check out our list, which leads into peak home-tour season in spring 2017. 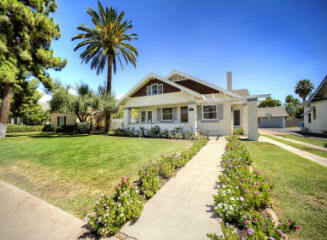 With over 900 homes, Willo is Phoenix’s biggest historic district. Once a year, Willo opens its doors to visitors with around 12 homes and the historic firehouse available to tour. The event also includes a classic car show, a beer and wine garden and a street fair with local vendors. Details: 10 a.m.-4 p.m. Sunday, Feb. 12. Willo Historic District, Third Avenue and West Monte Vista Road, Phoenix. $18. willohistoricdistrict.com. Visit historical homes in Revival, Norman and bungalow styles in the Coronado Historic District near downtown Phoenix in this tour’s 30th year. A street fair featuring local vendors, food trucks, bicycles and classic cars is part of the celebration. Details: 10 a.m.-4 p.m. Sunday, Feb. 26. Coronado Park, 1717 N. 12th St., Phoenix. $17 online, $20 day of; $5 for ages 5-12, free for 4 and under. thecoronadoneighborhood.com. Four contemporary and historical homes will open on this self-guided tour. They include the Hamline Residence, which was one of the original five homes built in Carefree, and the Binkovitz Residence, a modest mid-century modern home. No children under age 12 are admitted. Details: 10 a.m.-4 p.m. Sunday, March 12. 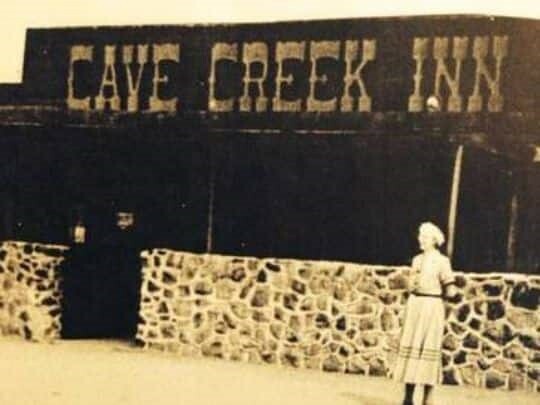 Cave Creek Museum, 6140 E. Skyline Drive, Cave Creek. $35 through March 6; $40 after. cavecreekmuseum.com. This stately Phoenix historical district hosts a home tour every two years. Visit several homes and learn about their history. Once you park, a trolley will take you to stops on the tour and to a street fair at Holly Street and 12th Avenue that includes entertainment, food and local vendors. There will also be a 21-and-over raffle. Details: 10 a.m.-4 p.m. Sunday, March 26. 2102 N. 12th Ave., Phoenix. $18 advance, $20 day of. 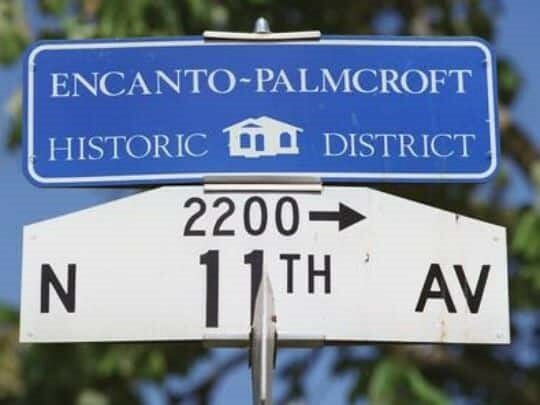 encantopalmcroft.org. For those fascinated with the Valley’s mid-century modern architecture, this is a must-do event. This year, the tour explores Paradise Gardens. The event has morphed into Modern Phoenix Week, with talks, socials and other activities. Details: Sunday, April 2. Tickets go on sale Wednesday, Feb. 1. modernphoenixweek.com. Are You Ready For A Big First Friday, 100 Years in Phoenix, and Final Four Fun October First Friday?! That’s right – it’s October, it’s fall and it’s beautiful outside. With so many exhibits going on for First Friday, it might be difficult to decide which shows to see, so here are a few we think you will enjoy. Rides and more info can always be found on Artlink’s website. Legend City Studios is proud to present the 17th installment of Chaos Theory, hosted by Randy Slack. This ever-popular group show will feature 80 local artists working in a variety of styles and medium, a well as music and light appetizers. Doors will be open from 6 p.m. to 2 a.m., located at 521 W. Van Buren. This multi-faceted exhibit will feature works from several local artists such as Bill Hemphill, Joe Holdren and Scott Wood. Each specializes in a different form of creativity from painting, to furniture, to music and more! Taking place in the historic Ice House, it has been nearly a year since the last show was hosted in this location and Phoenix is happy to see its doors open once again. Door from 6-10 p.m., located at 429 W. Jackson Street. Grand Art Haus is proud to present local artists Onna Voellmer and Michael Viglietta. This show will display two contemporary styles of work that range in media. This highly anticipated show will not only blend their styles, but allow for each piece to shine and breathe on its own. If you haven’t made it out the Art Haus yet, this is your reason! Open from 6-10 p.m. and located at 1501 Grand Ave near Woodland Historic District. Join local artists and print masters Jacob Meders and Chelsi Rossi for an exhibition of prints and print making. This show will reflect on the homogenization of indigenous people as well as the selective, alarmist qualities of the violence-addled news media. With political undertones, it won’t be a show for everyone, but I encourage you to attend. You just might feel something. Open from 6-10 p.m. and located at The Hive Gallery at 2222 N 16th Street near Coronado Historic DIstrict. Colton Brock is a name that synonymous with local art. His contemporary street style captures the city sunsets skyward details of an ever pondering mind. His color choices are superbly brilliant and truly harness the essence of what it means to live in such a colorful world. Don’t miss this show. Treeo will open its doors from 6-10 p.m. and is located at 906 N. 6th Avenue near FQ Story Historic DIstrict. Yours truly will have his first solo show at the MonOrchid for the month of October. The show will feature a variety of contemporary, pop-art style paintings of the Southwest that capture the idea of what it means to live, work and grow together here in Phoenix. I hope you will join for a colorful night of reflection. Doors will be open from 6-10 p.m. and is located at 3rd st. and Roosevelt. The Valley is seeing new inward development, a change from the outward expansion typical of metro Phoenix. There’s an urban revival going on in the Phoenix Valley, which has long been known for its affordable suburban homes. Karen Wang is buying a condo in the new 14-story Portland on the Park development in downtown Phoenix. Her new home is going up on a prime piece of land next to Margaret T. Hance Park that was a dirt parking lot when she moved here from the San Francisco Bay Area for culinary school 12 years ago. Of course, metro Phoenix had plenty of empty lots back then. It was rated as one of the cheapest metro areas for parking in the U.S. in the mid 1990’s because it had so much vacant land, especially downtown. Now, construction cranes and new housing, restaurant and retail developments can be found on many of those long-vacant parcels across central Phoenix, Scottsdale, Tempe, Mesa and Glendale. The Valley, an area that for so long has grown outward with new, affordable suburbs, is having an urban revival. Almost 4,000 condominiums are under construction, planned or were recently built in the central Valley, according to developers. Upwards of 8,000 apartments are being built on infill sites in metro Phoenix, according to ABI Multifamily. Infill land prices in the Valley have more than doubled in the most popular neighborhoods during the past 15 years, property records show. Home prices and rents are climbing the fastest in the Valley’s urban hubs. And the days of finding free parking on dirt lots in central Phoenix, Scottsdale or Tempe are as long gone as those vacant parcels. Millennials and Boomers are behind the shift in metro Phoenix’s development. They want to live where they can walk or ride bikes to where they work or play — or both. Builders are responding with many new high-density, high-rise condominium and apartment projects near popular eateries and shopping hubs. Not only are vacant lots being filled; older, often empty buildings are being transformed as well. Her commute to her retail job in Scottsdale will get longer, but her partner, Logan Stephenson, works in downtown Phoenix. Most urban planners support infill and high-density development because it uses less water, cuts back on freeway traffic and can create more walkable neighborhoods. “It is a reflection of the Valley maturing as a metro area when the value of land closer in becomes more valuable and demands higher uses or basically more density,” said Mark Stapp, a growth expert and director of the Master of Real Estate Development program at Arizona State University. “It’s a good thing for growth,” he said. Phoenix will never be a San Francisco, Manhattan, London or Hong Kong for high-rise living. The Valley also still lags other big cities such as Chicago, Portland and Denver for urban redevelopment. And growth on the Valley’s fringes will continue. But metro Phoenix is already a higher density city than most people realize. An average of 3,200 people live per square mile of the Valley, according to the Center for Neighborhood Technology, a national growth think tank. Gammage, who has been analyzing metro Phoenix’s growth for decades, said that makes the Valley a more dense area than Seattle, Houston, Charlotte or Atlanta. Los Angeles is the densest U.S. city with an average 7,000 people living in every square mile. Second is Las Vegas with 4,500 people per square mile, he said. But more condominiums and apartments are under construction or planned in the Valley now than any time since the boom. Most are going up in the central Valley on infill sites. People often try out an area by renting, experts say. Then they’ll buy if they really like it. Metro Phoenix’s typical growth trend has been reversed with infill. Retail followed rooftops to the Valleys’ suburbs. But now new housing is chasing new infill restaurant and shopping hubs. 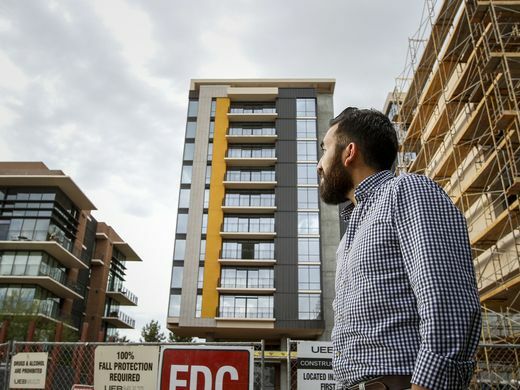 “Creating ‘high-connectivity’ hubs with high-density homes near restaurants, bars, shops, cultural centers and jobs is becoming the development pattern of metro Phoenix,” Stapp said. Downtown Phoenix, which has become a big draw for buyers, renters, eaters and shoppers. The area’s Roosevelt Row has several new condo developments, row houses and apartments. The Muse, with 367 apartments, is going up at Central Avenue and McDowell Road, a prime corner of the city’s skyline that has been empty for decades. Downtown Phoenix has the highest average apartment rents in the Valley. Central Phoenix, where there are several restaurant hubs drawing residents and new infill homes. There’s the Uptown area around Postino, near Camelback Road, where high-end townhouses are filling the last vacant spots. One developer is transforming old apartments into Frank Lloyd Wright-inspired condos called the Mason. Midtown Phoenix, where apartments and condos are going up among clusters of restaurants and shops across from Steele Indian School Park. In the Midtown neighborhood called the Yard, after the hopping restaurant hub on Seventh Street, home prices jumped 50 percent last year. Phoenix’s Camelback Corridor and Biltmore areas, which have very few empty lots left for development. Now builders are tearing down older apartments to make way for newer, luxury ones because so many people want to live near the area’s luxury shops and high-end restaurants. New projects are stretching this chic area’s borders south. “In the last 15 years the major urban cores of Phoenix, Scottsdale and Tempe have transformed to the extent that the population is now demanding planners make them increasingly vibrant,” said David Newcombe, a co-founder of Scottsdale-based Launch Real Estate and broker at Portland on the Park. High-density and vertical developments aren’t just going up in Valley downtown’s anymore, either. If an area has a popular restaurant and shopping hub, then developers are building, believing buyers will come. Pat and John Simpson are moving from their home in north Scottsdale’s DC Ranch to a new luxury condo at Optima Kierland. The 12-story development is going up on the Phoenix/Scottsdale border next to a resort, popular shopping and restaurant hub near the Loop 101 Freeway. In April, more than 1,400 new and used condos sold, according to The Information Market. That’s the highest monthly tally since mid-2007. “Creating higher-density housing like condos near central areas strengthens communities and provide people with an alternative way of living in the Valley,” said architect David Hovey Sr., who developed the Optima condos in Scottsdale and Phoenix’s Biltmore area and now is building in Kierland. Central Scottsdale, where the Old Town and the Waterfront areas are sprouting high-end condos and apartments near many upscale restaurants and shops. Condo prices are easily topping $1 million, particularly in the development replacing the Borgata shopping center. South Scottsdale, known as SoSco, which is drawing Millennials to its new apartments and older neighborhoods with more affordable porch homes. Apartment rents jumped 20 percent in this area last year. Tempe’s Town Lake and Mill Avenue, which led the Valley’s urban rebound. 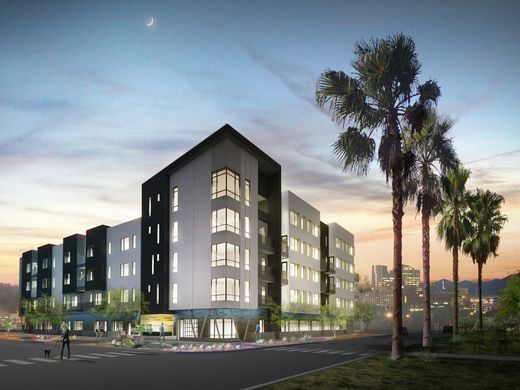 New developments underway on ASU land along the water will bring even more apartments and condos to the 24/7 area that is drawing not only students and Millennials, but Gen X-ers and Baby Boomers. Downtown Mesa, which is drawing its first new housing developments in many years and becoming a cultural hot spot. Metro Phoenix’s two biggest groups moving closer in now are Millennials and empty nesters or Boomers, developers say. These huge demographic groups seem to want to spend less time in their cars and taking care of homes with yards. The Koch family represents both. Ann, 55, and Bob Koch, 59 live in north Phoenix but are buying a new condo in downtown Phoenix’s en Hance Park for their daughter Kayla to live in while she goes to ASU. “We looked at renting an apartment for Kayla downtown and then realized buying could be a better deal,” Bob Koch said. He said when their daughter moves out, the couple plan to keep the condo, stay there themselves and share it with family and friends who want to enjoy downtown. Kayla Koch, 21, said she will walk to class and take light rail to her job in Uptown Phoenix at Flower Child restaurant. Some may question whether light rail has drawn enough riders to be considered a success, but few dispute the train tracks have drawn development and created new Valley growth hubs. Several of the Valley’s most popular new restaurant and shopping areas stretch along light rail from Midtown Phoenix to downtown and out to Tempe and Mesa. Housing has followed the train. Some planners expect to see similar hot spots for development in Glendale as light rail expands there. Light rail helped draw Adrian Zaragoza to downtown Phoenix. He had been living in north Phoenix and found himself driving everywhere, including to central Phoenix to hang out with friends. Five years ago, he began renting on Roosevelt Row. Now, he’s buying a condo at Portland on the Park. 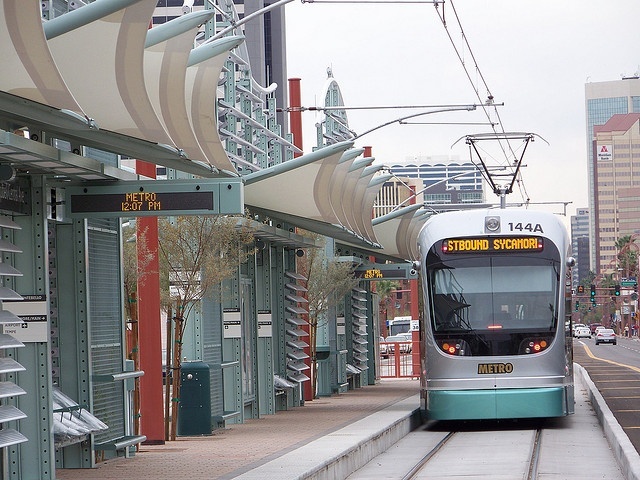 Patricia Gober, interim director of ASU’s School of Geographical Sciences and Urban Planning, said light rail has helped change metro Phoenix’s growth pattern. Urban planners say one of the biggest benefits from higher density housing is how it improves water conservation. Most infill developments use much less water than traditional neighborhoods with single-family homes. “A very rough but conservative estimate would be that a typical high-rise household would use at least 50 percent less water than a typical single-family home on the Valley’s fringes,” said Sarah Porter, director of the Kyl Center for Water Policy at ASU’s Morrison Institute. Based on several recent studies, she estimates a metro Phoenix high-rise home uses an average 4,000 to 5,000 gallons of water a month. That means a Valley single-family home with a yard uses an average 8,000 to 10,000 of gallons of water each month. “In the Valley, up to 70 percent of household water goes to outdoor uses, though the average percentage per household has been declining,” Porter said. Water usage is an important growth factor for cities in the West like Phoenix dealing with shortages and long-term droughts. But not all urban planners think a big shift to infill development is the right growth path for the Valley. He said metro Phoenix’s big draw for new residents is relatively inexpensive housing. But Gammage and Stapp said they think there’s demand for both infill and high-rise homes as well as more affordable single-family houses farther out in the Valley. Density appeals to Wang, who the Bay Area transplant who is moving to downtown Phoenix. She said it’s tough to compare Phoenix to San Francisco, New York and Los Angeles for downtowns. Roosevelt Row is the epicenter of all things First Friday, but sometimes venturing off the beaten path woven through Phoenix Historic Districts such as the Historic Roosevelt Neighborhood, can pay off in fun and unexpected ways. From free admission at the Children’s Museum of Phoenix to shopping in a shipping container, the Downtown Core offers some artsy, quirky and educational experiences Friday, May 6. Skip out of work a little early or indulge in some retail therapy during your lunch break — it’s Friday after all. Stark James, the architecture and development firm behind Containers on Grand, have partnered with local t-shirt makers State Forty Eight to create a mobile, custom-made pop-up shop out of a shipping container, debuting for the first time 11 a.m. to 5 p.m. at Civic Space Park. Load up the kiddos and head to the Children’s Museum of Phoenix, which is open to the public free of charge every First Friday. Explore 48,000 square feet of hands-on learning, art displays and play areas fit for the whole family, including specific zones geared toward toddlers and preschoolers. Exploring the Arizona Science Center after dark already feels special. Add in the fact that it’s adults-only and there’s booze — and you’ve got the perfect date-night adventure. Enjoy access to four-floors of science fun, signature cocktails and discounted access to Popnology, a special exhibition focused on pop culture-inspired technology. The lecture series “The Future of Transportation: An inside look on how future cars are designed, built and operated” starts promptly at 7 p.m., followed by a discussion on transportation innovation. Located on the corner of Monroe Street and Third Avenue, the beautiful Grace Chapel (which is rarely open First Fridays) is home to Release the Fear, an arts-centered nonprofit working with at-risk youth. Not only does the organization teach art, music and communication skills to kids in detention, treatment centers and schools, but some of their fantastic artwork is featured on the gallery walls and historic alter. The Step Gallery at Grant Street Studios is really an artistic marvel in and of itself. In a converted warehouse just south of the Downtown Core, this exhibit explores modern Americana through ceramic sculpture and video installations. “For Closure” addresses issues of income inequality, predatory financiers and oligarchical policymakers in a thought-provoking series by Jonah Amadeus. This is his MFA thesis work for the Herberger Institute for Design and the Arts, and the show runs through May 8. In a nearly 100-year-old former commercial laundry in the Warehouse District, the Bentley Gallery features gorgeous museum-quality exhibits in a variety of mediums. Whether it’s work on paper, metal or wood, the nine artists featured in “Off the Wall,” explore the relationships between color, form, the viewer, the wall, and the space in between. The exhibition, which runs through May 31, is all about the interplay of positive and negative space and the power of three-dimensional art.